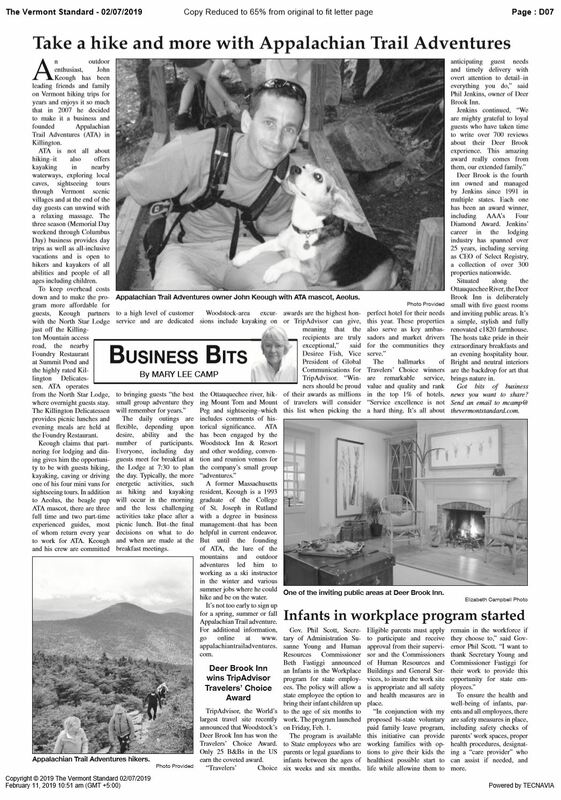 Local Paper ran a story on ATA! The 2018 hiking season has come to an end after a quick but spectacular season of fall foliage. Viewing the fall foliage in New England should be on your bucket list; as a matter of fact, Appalachian Trail Adventures is the only hiking spa open in Killington during the peak time for fall colors, the first and second week in October. Come experience foliage next October! We are currently taking reservations for the 2019 season. We are very excited that after a few months of delays, ATA’s new webpage is finally live. There is still a lot of work needed, so I will be very busy over the next month uploading pictures, updating the text and tweaking things. Aelous has kept hikers quite entertained this past month with a number of incidents, besides just being a cute, friendly, energetic beagle. Waiting for hikers to come out of the inn, Aelous is usually staring at the front entrance door, wagging his tail, waiting to greet everyone. However, one morning his tail wasn’t wagging; it was hanging very low and looked a little larger just a few inches from the base. I touched it and he let out a large yelp. The veterinarian believes that since I didn’t recall an incident, such as his tail being shut in a door, and since we kayaked the day before, he must have “swimmer’s tail.” That is when a dog’s tail breaks or gets sprained while swimming. He has had a full recovery—and that tail is back to wagging nonstop. While hiking one day, I noticed Aelous slowing down; he’s usually out in front or doing circles around us, running nonstop. He also was licking his paw. My past experience told me he might have a cut. Checking it out, I found a porcupine quill that he must have stepped on while hiking. I broke out the Leatherman tool’s tweezers, but had the hardest time pulling it out. Aelous was yelping very loudly and trying to escape—but eventually the quill came out and he was back to normal, running nonstop. That same week while having lunch at a pond’s shoreline, we had some free entertainment. Aelous gave a good tug, breaking free from the leash in my hand, and proceeded to jump right in the water, swimming after some geese. (My poor beagle can’t swim fast enough and has no chance of catching the geese, but he thinks he can.) After a few screams for him to come back, Aelous eventually listened, turning around toward the shoreline. Later that month while hiking I heard a yelp, then noticed Aelous limping. Something was wrong with his paw again, but I had trouble seeing it until a guest pointed out a very small thorn. I broke out my glasses and surgical tools, a.k.a. my Leatherman, and removed the thorn easily. Fall foliage is here! If you wanted to see New England’s Fall Foliage, you still have time. We close for the 2018 season October 15th. This pictures was taken today! There’s nothing more annoying than taking the time to fill out an inquiry form or emailing a travel company and not getting a response for days―and sometimes not at all! We make it a priority to get back to all of our clients as quickly as possible: no more than 48 hours, and on the same day during business hours. Personal Service by ATA Founder and Guide! When you make an inquiry about one of our vacations, you will receive personal service from John, ATA’s founder and guide. You are provided with his contact details so you can email, phone or text him directly! That’s right; no call centers here. ATA’s personal service doesn’t stop at the phone, it continues on to the hiking trail and beyond! ATA vacations have firmly stamped their mark on the travel industry in Vermont. We’ve won the 2017 North American Excellence Award for Best Wellness Vacation Organization in Vermont and received TripAdvisor’s Certificate of Excellence four years in row, including being their #1 Attraction in Killington for eight years running. In addition, we won Best in Luxury Spas Awards 2017 by LUX Magazines. What this means is that ATA is ranked as one of the best in the industry―and if you need help, you can draw on John’s experience to help plan your holiday even beyond your stay with ATA. John, ATA’s owner, lives locally year-round in the Killington region. ATA’s philosophy is to support local business. We subcontract accommodations and breakfast out to the North Star Lodge, lunch is supplied by the Killington Delicatessen, dinner is served at the Foundry Restaurant, and yoga and massages are subcontracted to local massage therapists and instructors. All these businesses are owned by locals living in the community. Also, ATA’s tours stop daily at local businesses from country stores to artesan shops, supporting the local economy. We are not like other hiking spas or resorts who keep you on their property during your entire stay, supplying all the meals, and then live out of state during the off-season. Money spent at ATA stays local! ATA specializes in adventure. That means when you book with us, you know your vacation is being dealt with by a specialist whose sole focus is delivering you the best possible vacation experience. You can try to compare; however, no other company offers you all these adventures in an all-inclusive vacation like ATA does. Adventures include guided half- or full-day hikes for all abilities. The half-day hikes are then followed by an afternoon with a variety of exciting options, such as kayaking on a lake or flat-water river, caving trips or sightseeing excursions to local villages and attractions. Unlike almost all travel companies and hiking spas, we do not charge service fees. We provide the level of service we’d expect if we were booking a vacation for ourselves. As a personalized vacation provider, we take a personal interest in all our guests and take great pride in the loyalty our alumni have shown us since our inception. ATA is committed to providing the highest quality of customer service combined with the lowest possible price. You will not be able to find the same vacation and level of personalized service at our prices anywhere else. ATA’s guides work hard behind the scenes and on the front lines, doing their very best to ensure a worry-free vacation for you. With our extensive knowledge, we have dedicated ourselves to bringing you an adventure you will remember for years to come! Don’t want to take our word for it? Check out our 180-plus extremely positive reviews on TripAdvisor―they show our commitment to the highest level of customer service. Read ATA’s reviews on TripAdvisor.